Photographer Joseph Wingrave was the only Coventry based commercial photographer from the nineteenth century that took photographs of the city outside his studio and most of his photographs will date from 1860’s and 70’s. 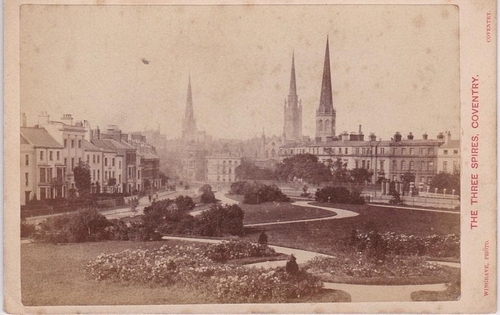 This cabinet card shows the three spires of Coventry. Wingrave was born in Luton in 1821 and moved to Coventry in the 1840s. He opened a Chemist shop in the High Street. He died in 1897.